Highways, freeways and railways are physical barriers, often dividing our communities by splitting a city in parts. 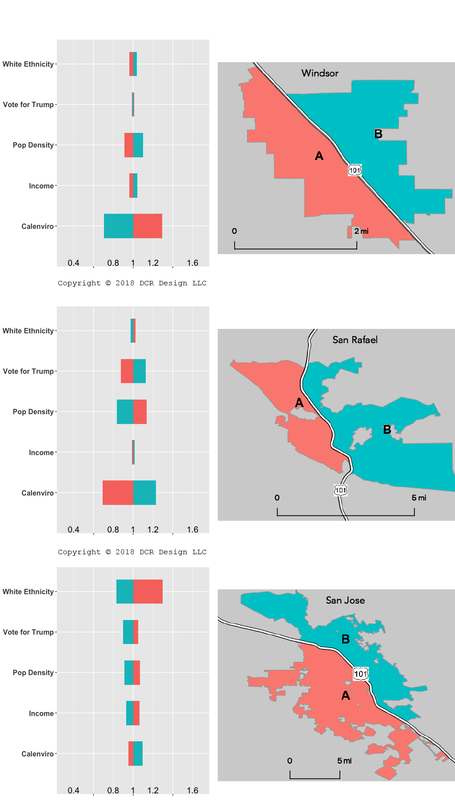 The question is if such division has an effect on the demographic and socioeconomic composition. One may also wonder if such differences were already in place before the road was built, and if they are possibly accentuated over time? 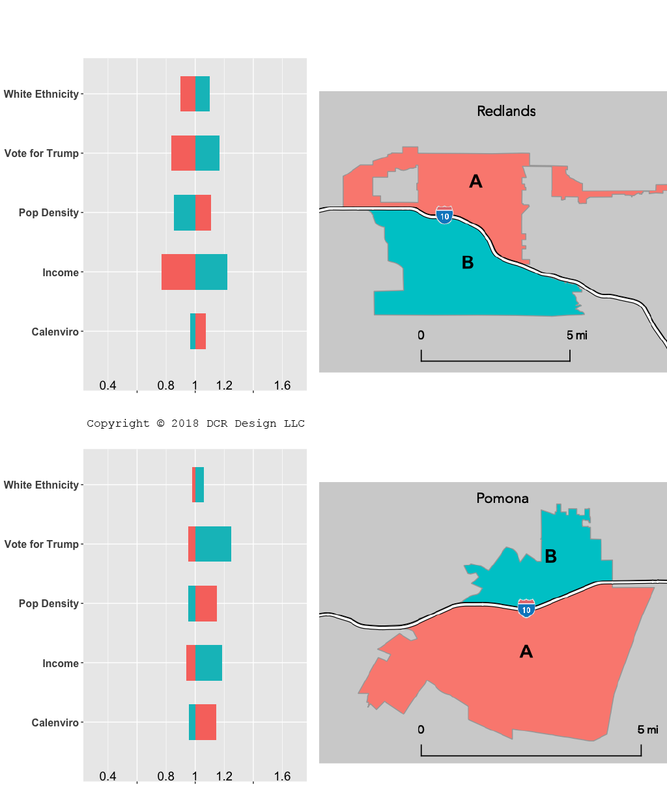 For example, in Redlands (top figure) the income per capita in the southern part (B) is about 1.2 times the city average. Similarly, the northern part (A) has a slightly higher (worse) CalEnviroScreen score. The width of the bars indicates how big the difference is, in other words – a narrow bar means a more homogenous measure. The data for this study was compiled from open data sources and processed by using the GeoTuple platform. First the average, for each variable, was computed for the city as a whole. Then the average for each part was calculated and finally the ratio for each part vs the whole city was calculated (a value of 1 means no difference). The resulting data can be found here. 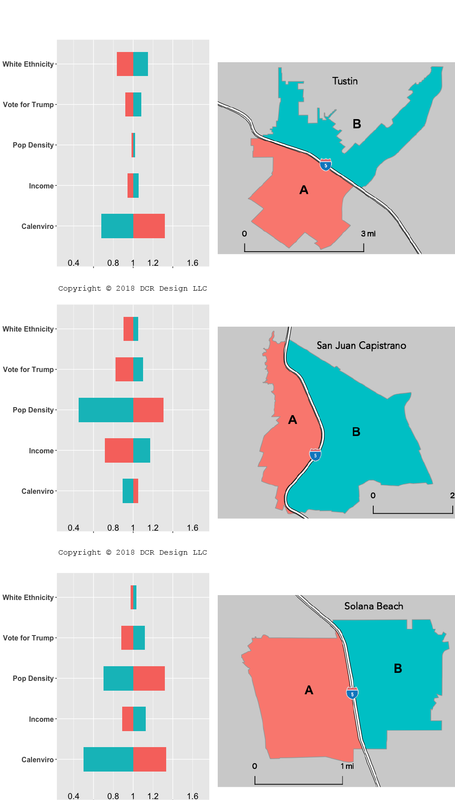 It is interesting to note that the CalEnviroScreen score, which is a composite of environmental, health, and socioeconomic information, generally aligns with the parts of affluence. Understanding the patterns and trends for real estate valuations is important for: city planning, identifying demographic imbalances and in revealing investment opportunities. Visualizing this data in maps provides accessible insights that are otherwise difficult to gain. 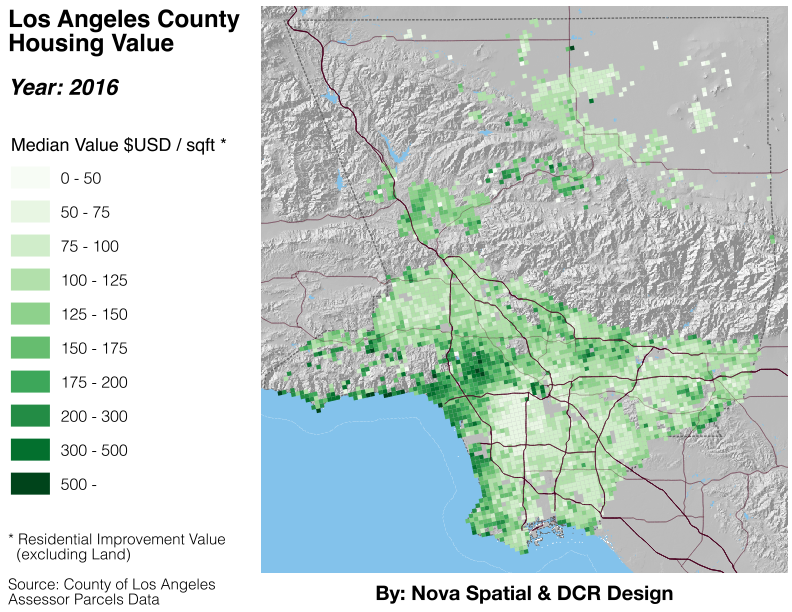 The data behind the above visualizations is derived from the County of Los Angeles Data Portal – Assessor Parcels Data. This dataset contains a set of attribute fields for each of the 1.1 million parcels and year. In order to make the most accurate estimate, the “Improvement Value” along with the “Improvement Base Year” fields were used for the selected time period. This is because changes are triggered only by re-appraisable change-of-ownership as established by Proposition 13. By overlaying a grid (1*1km) and identifying every parcel inside each grid cell by the recorded year (Improvement Base Year), a valuation can be calculated for each area and year. The median value was used so as to exclude outliers.